TNT-Audio has already reviewed Atoll HiFi components, namely the integrated amplifier known as IN 80, which is the bigger brother of the IN 50 under test. This is the smallest amp made by the dynamic French Company, though this "silver" version is somehow a "limited" edition with better components here and there. The "standard" version comes with a plain black finish. The Atoll IN 50 is exactly what audiophiles would call a "minimalist" integrated amp: just two knobs (volume and input selector), an headphone jack (surprise surprise! ), one "tape monitor" switch, a green "power on" led. Nothing else. The on-off switch is hidden in the rear panel, next to the mains IEC socket. The IN 50 has 4 line inputs + 1 tape loop + two unusual pre-out RCA's, meant to be used to drive two separate power amps when bi-amping. Neat. The loudspeakers gold-plated binding post accept any kind of cable termination (bananas included) but are not doubled for biwiring (not a real problem, though). Technically speaking, the French integrated has a claimed power output of 50 watts per channel on 8 ohm and 70 watts per channel on 4 ohm. Peak dynamic power is claimed to be 90 watts per channel (no load was specified). The line inputs offer an impedance input load of 16 kOhm while the CD input has 47 kOhm. 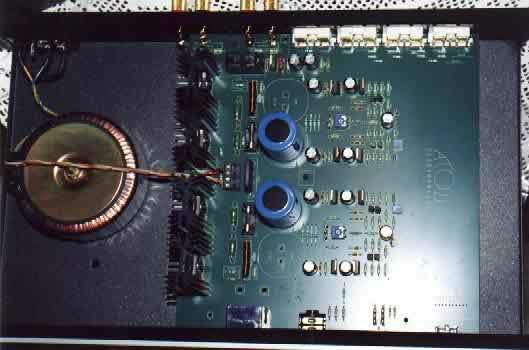 The power supply section makes use of a 160 VA toroidal transformer matched to 2 x 6,800 uF capacitors. The volume pot is from ALPS (blue series) and the rest of the passive components are of good quality. The cabinet is 44 x 9 x 25.5 cm (W x H x D) and the whole package weighs in 7 kgs. The Atoll IN 50 has many competitors in the same price range. Many of these, for the same price, offer a lot of features: a remote control (even the most minimalist ones), several inputs (or a phono input) and, very often, an overall manufacturing quality that can create some trouble to the small French amp which is ugly, poorly finished and extremely minimalist. So it has to fight its competitors in terms of sonic performance. We'll see. The Atoll designers have worked hard to improve the sonic signature of the bigger brother IN 80 and, so far, it seems they succeeded. The new "limited edition" IN 50 is smoother and sweeter, less aggressive than its brother. It still preserves that solid and strong character the IN 80 was known for, but it does better in the mid-high range department. Actually, the price tag is now very close to the IN 80, so one can say this new amp is a dangerous competitor for its own bigger brother. The family feeling is still there, though: open, clear and crisp in the mid-high range, a good "presence" of the mids and a stout bass range, with plenty of punch. The "presence effect" in the mids is due to a detailed analysis of the musical program, matched to a unobtrusive and controlled mid-bass. The bass range is exactly what I expected it to be. Only the extension towards the first octave could be improved, which is normal, considering the price tag. Exactly like its bigger brother, the IN 50 doesn't try to follow intricate musical patterns, it just heads straight for the heart of Music. For this reason, some of the harmonics of the piano are somehow lost in the middle of nowhere and so the echoes of some recordings. Roughly speaking, we can define this amp as "dry", controlled and fairly silky in the highs. Now you're talking! The dynamics department is where the small French amplifier can show its best qualities. Fast, punchy and crisp, especially in the mid-bass and bass range, the IN 50 can bring new life to your rock tracks. Take the kick-drum, for example. This is a very tough test for any small integrated amplifier as it requires an excellent rise-time coupled with the ability to deliver high current after the pedal has been hit. Many amplifiers succeed reproducing a realistic "attack" (the "crack" of the pedal on the leather) but fail to reproduce the whole harmonic content of the "bam" that follows. Others, being unable to deliver a realistic attack, try to give everything "after", making the kick drum sound gummy and boomy. Not so the Atoll IN 50, which does and excellent 1-2 job: good and fast attack, powerful and realistic decay. This little amp can sound pretty loud when required and it seems it can drive even quite heavy loads. I've had the feeling it didn't welcome the high capacitive load offered by a pair of new DIY cables I'm testing. No problems with standard cables, though. My notes cite a very good height of the image, something quite rare in this price range. The other two spatial dimensions are good, though the depth is a bit sacrified because of a sound that tends to be a tad "forward". This is due to the open and crisp mid-high range and it is up to you to decide whether it is a plus or a minus. Actually it is a pure matter of personal taste and listening experience. Some listeners prefer "near" virtual planes. I still prefer good depth and "far" virtual planes. Nothing much to suggest here, the Manufacturer recommends a 30 minutes burn-in before serious listening, since the output stage needs to reach the right temperature. Actually, the IN 50 runs pretty cold, both at low and high listening levels, perhaps because of a low quiescent current (bias). The stock feet should be replaced as soon as possible, though they aren't all that bad. The Italian importer (Miroire de la Musique) suggests to use G-Flex spring suspended isolators but, given their quite high price, I'd suggest to use them with more expensive HiFi components only. Change the mains cable as soon as possible. There's a beautiful IEC socket just waiting for one of our DIY designs. Finally, use the input selector to activate stand-by mode and leave the amp this way when you're not listening to your system. Manufacturing & finish. More or less, you can refer to what I wrote in the review of the bigger broher Atoll IN 80. Summarizing, the cabinet looks (and actually IS) cheap, resonant and grossly finished. One of the two pre-out RCA outputs is so close to the loudspeaker binding posts that using massive RCA connectors is almost impossible. The silver finish looks better than the black one but the finish of the aluminium front plate screams "CHEAP!" loudly, especially if you consider the price has been increased above the 700 $ /Euro tag. Hence, considering again the price tag, a remote control would have been mostly welcomed. Looking at its competitors in the same price range it is not so hard to find either better finish, manufacturing, features or ease of use. Sonics. The sound is now much more "universal" than that of the IN 80, smoother and easier to match with almost any speaker. My "I'd like" list contains: more bass extension (first octave), better bass articulation (first octave), less "forward" sound. The Atoll IN 80 was a market-shaking integrated amp, at least here in Europe. It had a personality so strong you couldn't help but notice it. The IN 50 preserves some of the qualities of the bigger brother and makes even better in the mid-high range. The quality of the sound is high, as is the price, considering what the IN 50 has to offer in terms of features and overall quality. I'd suggest it for any serious "minimalist" audiophile on a budget, for example paired with an Atoll CD player (CD 50, 80 or 100).